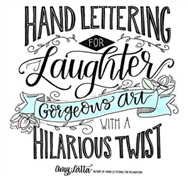 Get ready to giggle your way through these clever hand lettering designs with bestselling author Amy Latta, back from her books Hand Lettering for Relaxation and Express Yourself: A Hand Lettering Workbook for Kids. Whether you’re lettering for the first time or brushing up on your skills, you’ll be highly entertained as you create your own works of witty, hand lettered art. Draw, doodle and dream right in the book on high-quality paper that will make your designs pop. With tons of ideas for special hand lettered projects like pillow covers, gift tags and personalized signs, it’s easy to share the laughter. Be careful: It’s contagious! Amy Latta is the author of the bestseller Hand Lettering for Relaxation, as well as Express Yourself: A Hand Lettering Workbook for Kids. She’s a hand lettering designer and the founder of amylattacreations.com, where she injects some much-needed humor into the world of calligraphy. She lives in Hampstead, Maryland.